I may be old school and at some points in my life I had succumbed to the teachings of the conservatives. It wasn’t until I stopped surrounding myself from those who were following blindly the conservative teachings that I took a look around to really see God. God has always been a convenience for those with authority to wield at those who follow them in a form of control. God never wanted blind followers, he never really wanted to have us be led by government officials but he gave in to our whelms and decided that it may be better. Man has deceived us by stating they are the true word of God and never really consulting God about those words. Agenda of the political gains is all about control of the masses. It always has been regardless of the god and regardless of the factions of followers. Once I removed the blinders and began to look left and right instead of just centered on the values being taught to me weekly that I truly began to see God. Be brave, remove the blinders and see God for who he really is. I cannot tell you who he is, you must find that out yourself. Only you can know God the way God wants you to know him. Get your nose of the Bible and get your eyes looking around you to truly see God as he wants to be seen. The comforting words of the Bible should not be dwelt upon so blindly that we do not see God and what he is telling us. God has never been the causer of tragedy. Unfortunately there are passages of the Bible that make it seem as such. There are great leaders who knew God to the point of being able to ask God to do many great things. Moses comes immediately to mind but we can be just as owning of the works of God. I myself know the power of simply asking God to help in a situation of my life. For instance I have asked God to hold off on a down pour of rain until we were safely tucked back into the car and he did. Was that coincidence or was it actually God, only those involved can answer that for you. It seemed to me to be a response from God. When you’re in tune with God and communing with him daily then many such coincidences can occur with you as well. As for the mass shooting, there was a deranged individual, who had some agenda other than God, who lashed out at a crowd of individuals who were having fun. The fun ended in tragedy, not caused by any God I worship, it may have been caused by someones god but I doubt that as well, because someone wanted to end his life and take others from the world with him at the same time. Tragedy is never caused by God but God can be used to help with those who suffer from it. God should never be blamed though as a source of the tragedy, God set things in motion and allowed man to have the will to do what he would. The same is true with the Earth and other planets, God doesn’t use them to punish us, he uses them to amuse us and to allow us to live with a will that either loves him or doesn’t. What has God done for you today, or yesterday? Today I was given great news that my mother is cancer free. She never had cancer but they were testing for it. Was it coincidence or was it the power of my prayers? Only I know for sure and I cannot convince you, only the God you worship can answer that. Beautiful. Thanks for writing. I humbly submit one correction: In fact, as hard as it is to say and as difficult as it may be to hear, the truth is, until America wakes up to the true connections between conservative Evangelical Christianity and many of the deepest ills of our society, lasting change will **allude** us. Elude. never fails, always something I miss no matter how many times I read over a blasted article! I have never been an Evangelical Christian; just mainstream protestant. I am really much more metaphysically minded in the past 50 years as it makes much more sense to me. I have to hold my inner feelings of despair & disgust down when I read what some of the Evangelical pastors & writers say; alluding to their god bringing incidents like hurricanes and mass shootings on innocent people. Talk about heads in the sand. It’s a wonder they don’t suffocate on their writings! Keep writing from your heart. I certainly am in agreement with you. B.J. thanks so much for taking the time to read and comment on the article. Sure do appreciate your encouraging words, you are not alone, there many of us walking out a new sense of faith! I am amazed at how close your article comes to the truth but still misses the target. You are 100% correct that many modern “Christians” will say that “God caused this because…” but I fear that this because they do not know God. When you read the Bible , the Word of God, you can see what happens when man rejects God. Tradjedy befalls him not because God punishes him but because we have turned away from God and won’t allow him to protect us. God God wants us to protect us not to punish us. It is like throwing away your umbrella in the middle of a rainstorm and wondering why you get wet. We reject God and then wonder why he doesn’t protect us. Will he not protect those to turn to him? Does his word not say return to him and he will heal your land? We are misguided as a country as a whole. It is not just the left nor just the right that needs to change it is our nation. We spend our time blaming the things that we do and don’t do on the tragedies that befall us when the simple truth is God didn’t cause it he simply didn’t stop it because we have already told him we don’t want him to. Modern Christians don’t know Him because they want His Word to fit their lives rather than their lives fit His Word. Modern atheists don’t know Him because they don’t want to model their lives after His Word because to do so they would I have to admit that there is something greater and more knowledgeable than themselves. God has extended an invitation to each and everyone of us to allow him to be the Lord Of Our Lives, to love us in to protect us, and greatest of all, to provide everlasting life. Know where in the Bible does it guarantee that we won’t have hardship in this life, in fact, it lets us know that some things will be harder but there will be no hardship for those that know Him and love Him when he returns to claim what is rightfully His. To The Atheist I believe he will say I gave you every opportunity to know me and yet you rejected me. To the modern Christian I believe He will say “I never knew you”. Mark, thanks for sharing your thoughts in reflection to my article. Where I completely understand your perspectives as I once believed the same, I respectfully disagree with your basic conclusions. In the end, we all have much to learn, and I thank you for engaging this article thoughtfully! The day we stop learning is the day we are all doomed and there is no better way to learn (other than screwing up maybe) then to listen to others. Thank you for not only expressing your opinions but for respectfully listening to others even though may conflict with your own. On a side note… I would point out that I am pretty much a social media troll because I do not have the time to follow people as I would like so it may be awhile before I respond again but unlike some others, I hope to find time to “troll” your posts again in the near future. Until then, God bless. So glad I found your blog. Great post! You say what I have had a hard time articulating, but have felt for some time. I’m so glad I found you! 🙂 Thanks so much for reading and appreciating my work. Hope we can stay connected. If we aren’t friends on fb already, let’s be friends! For still unknown reasons this man committed an act of Domestic Terror!! No “Higher Power’ sent this man to commit this HORRIFIC act against 22,000 innocent people! Why would any God do this?? Americans REFUSE to ADMIT and deal with the fact that our DEPRAVED society creates this type of individual!! I hope someday that Conservative Christians GROW UP !! “Truth be told, there is no greater deception being wielded upon all the earth than the attributing of human tragedy and harm to the authorship of God…” As a person who ascribes to the biblical world view, I thoroughly agree with you. I might be considered conservative by many, but I, along with many, many Christians do not cast our lot with the likes of Pat Robertson. Look up ADRA online, and see that there are all kinds of people that call themselves Christians, including those you might applaud for their sacrificial efforts to provide disaster relief without religious strings. Thank you for your article. It was well argued, “almost completely grammatically correct!! !”, and says in a far better way than I could that we individuals are responsible for our actions and must accept the consequences of them. We are not living under “The Law” of the Hebrew Scriptures. Through Jesus we live in an age of Grace. Almost 50 years ago, in the following paraphrase of a sermon by an Episcopal priest, the light dawned on me. Jesus wants us to love him and to believe in him. He knows that, if we respond to him because we dread God’s wrath, we will be acting out of fear and not faith. It will replace love for God with obedience. So God might be able to scare the hell out of us, but he knows that he can’t scare loving trust or heaven, into us. To do so would pervert God’s nature and achieve the antithesis of his desires. God has not given us a spirit of fear to behave or else. 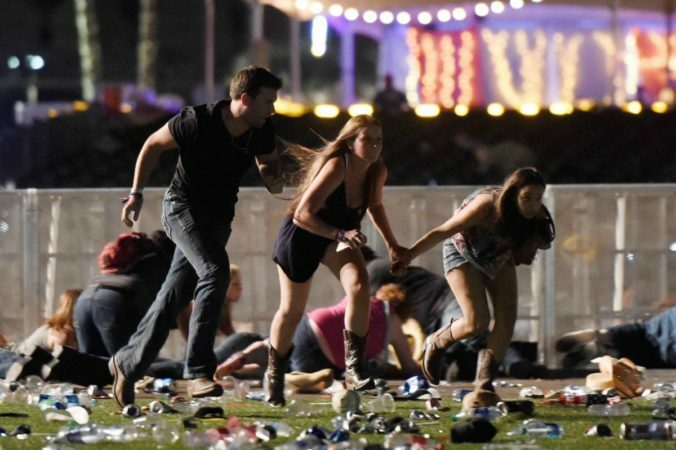 Thus God didn’t pull the trigger in Las Vegas; it was ultimately an act of free will. If God is pulling the strings on our actions, we are all just his marionettes. It would mean that the people who died or were wounded didn’t make a free choice to attend the concert. It means that the people who planned to attend but missed the concert didn’t do so because they were late for a plane or had car trouble or got sick. It means that God writes plots more terrifying than Stephen King novels. It also means we lack a real choice to accept God’s grace and to love him and others freely. God insists that we be free, and freedom means we are free to do either good or evil and free to accept or reject God’s grace. I believe you are correct in that our loving perfect God is not involved with sending hurricanes mass shootings or anything akin to them. In order to have real and genuine love. He did wisely, thoughtfully and graciously give us Free will. It’s this Free will gift that is at the root of mass shootings and the like. If God chose to stop such inhuman actions we would not have Free will and would loose Free will and love. We must choose right or wrong. We also must suffer and or enjoy the consequences of our choices. The foolishness of trying to lay our actions and consequences at the feet of or perfect loving God is extremely foolish simplistic and cruel. Father God, Jesus and Holy Spirit!